We are pleased to inform you about a fantastic new product we now have in stock. Produced by Bolyu America, a world leader in the flooring industry, this new line of carpet tiles features innovative technology and an attractive, decorative appearance. Bolyu carpet tiles are now available (while stock lasts) in five different colour tones and patterns to complement any commercial space or office interior. What is so unique about Bolyu Carpet Tiles? These carpet tiles are manufactured with two ground-breaking innovations: Puralex and Nexterra. Puralex, the proprietary creation of Beaulieu, reduces odours in the room by breaking down airborne organic molecules into inert material. All smells – such as smoke, ammonia, and food (even fish!) – dissipate quickly. Puralex is a safe, salt-compound product that is embedded into the carpet during manufacture. Air circulation continually renews the molecules, so they do not deplete. Bolyu now includes Puralex technology as a standard feature on all of their carpet tiles. Nexterra modular carpet tile backing is a high-performance and low weight flooring system that withstands long-term use. Constructed from at least 40% recycled content, such as PET beverage bottles and glass, Nexterra diverts waste away from our overflowing landfills. Also, no water is used to produce this carpet tile backing. The tiles are easy to install and lay flat with complete stability; they don’t curl or dome. Altogether it is a winning example of sustainable design, recognised widely by trade shows and magazines. Are you renovating? Did you move into a new office? Bolyu carpet tiles are an ideal flooring for any commercial property space or interior office, no matter what type of business you run. 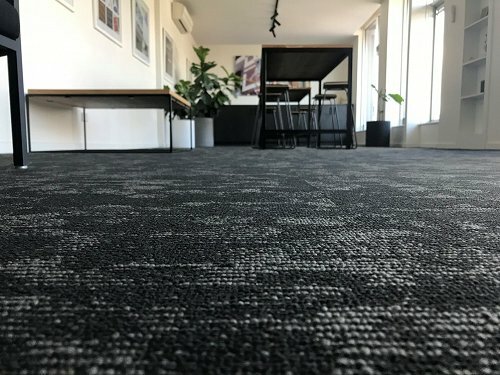 In fact, we just moved into a new office and chose to install Bolyu carpet tiles – We are very pleased with their performance and highly recommend them! The durable Bolyu carpet tiles function beautifully, as well as enhance the look of our space. Along with Puralex to keep our rooms smelling fresh, and eco-friendly Nexterra to preserve the environment, what more could you ask for in a carpet? We are proud to be able to offer Bolyu Carpet Tiles for the first time in Australia. We have a range of attractive and stylish colours currently available. If you would like to learn more about the range and receive a free sample, contact our team today.